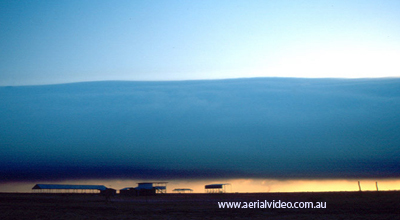 The Morning Glory Cloud video footage and images here are from Baddog Productions Australia who have recently produced a documentary on the Morning Glory Cloud. The Gulf of Carpentaria, Queensland, Australia is home to one of the world's most extraordinary meteorological phenomenon, the Morning Glory Cloud. One kilometre high stretching from horizon to horizon the "Glory" is a shockwave in the atmosphere of immense proportions. The meteorology of the cloud that follows is the result of many years of chasing Glories since Russell White and I first soared the Glory in a two seat Grob motor glider in 1989. This diagram was produced by Dr. Doug Christie of the Australian National University and included in research papers he produced on the Morning Glory Clouds in the late Eighties and early Nineties. It identifies the origins of the 3 Morning Glory types. For most of the middle of the year Gulf of Carpentaria has typical tropical dry season weather patterns - fine days with light to moderate south-easterly trade winds. The MSL chart to your right is typical of these conditions. Towards the end of the dry season the land mass heats up and a heat trough running southward through inland Queensland forms with an associated high pressure ridge along the Cape York Peninsula as shown on the MSL analysis chart to your right. This trough encourages the formation of seabreezes around the Gulf. This 10m wind analysis chart shows the late evening low level seabreeze patterns the day before before a glory. The seabreeze convergence areas to the south and south east of the Gulf are the origin of the rarer Southerly and South Easterly Glories. Before the wet season starts the weather starts to alternate back and forth between wet season and dry season patterns with cycles of three to four days of dry season SE trade winds followed by a few days of sea breezes associated with the heat trough. These patterns signal the onset of the brief Morning Glory season and there is always a seabreeze and high humidity the day before a Morning Glory. The penetration of the seabreeze fronts around the Gulf produce convergence lines as shown next. This computer modelling was produced by Professor Roger Smith of Monash University showing the convergence line of the Cape York east coast seabreeze and the prevailing SE trade winds up to approximately 10,000 feet. This line tends to move westward during the night-time in the form of the Northern Australian Cloud Line (NACL). The NACL propagates as a line of convection in which showers and thunderstorms can develop as the wet season approaches. If the animated modeling here has frozen you may need to reload the page to view it properly. This photo was taken by Roger Smith of the Northern Australian Cloud Line as it propagates across the Gulf. The NACL propagates south westward and generally, whilst over water, it takes this ragged appearance. 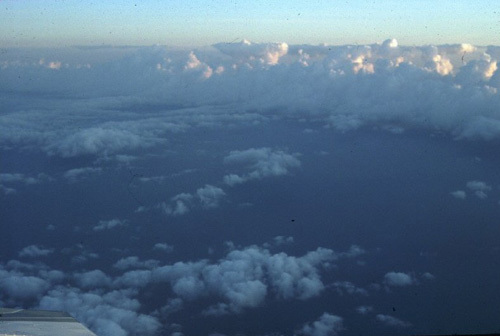 The southern end, if conditions are suitable can form into single or multiple Morning Glory Clouds. This satellite image shows the NACL with the Morning Glory Clouds appearing as it's southern extension with a number of waves forming as it is squeezed under an inversion (around 5000 feet) left over from the previous day's seabreeze. It appears that a Morning Glory type disturbance is an atmospheric undular bore which have similarities to tidal bores which travel upstream in various rivers around the world. In the case of tidal bore the leading edge of a tidal surge penetrates into shallower water forming one or more waves against the direction of the current. 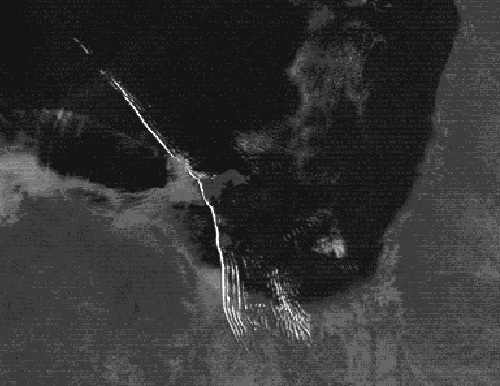 This satellite photo is an example of the how the convergence lines shown in the above 10 metre wind analysis would propagate into and across the Gulf after about 8 hours (note - this is not the same day as previous chart... On that particular day only a NE Morning glory was observed). Here is a rare example of a Morning Glory type cloud formation seen in the Joseph Boneparte Gulf in the Kimberly region of Western Australia on the 23rd of October 2002. Click on the image for meterological information. 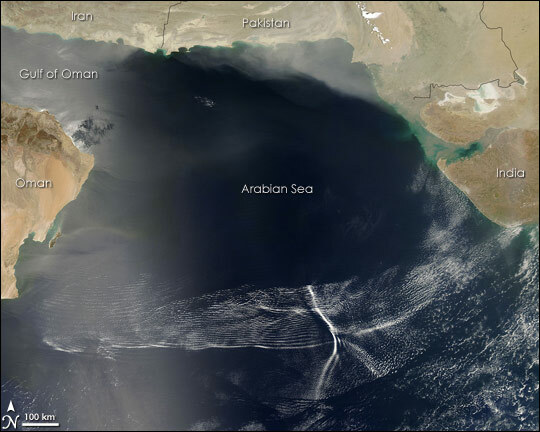 Intersecting undular bore systems in the Arabian Gulf. It looks here like a large seabreeze front in Iran and Pakistan has propagated offshore and then collided with another one coming from India. These systems are probably more common than we think but they most often happen over water. - Professors Roger Smith, Doug Christie, Michael Reeder, Thomas Peacock and Jorg Hacker for their valuable information and knowledge.